Our recent previews about BioShock 2 have raised some questions among fans and skeptics of the series. How has the series' resurrection system been tweaked? And why can't players backtrack to earlier levels in the new game? We got answers. Yesterday, BioShock 2 creative director Jordan Thomas walked me through how the Vita-Chambers will work in the new game. These devices would resurrect players when they died in the first game. But many players discovered that, upon resurrection, the damage they inflicted on enemies remained, making it easy to die, resurrect repeatedly to win a hard fight. Downloadable content for the first game enabled players to shut the Chambers off. The system was further modified for the sequel. "You can turn them off if you wish, making the game much more traditional." Thomas said. "Within that, you can adjust your difficulty to make it more or less of a challenge to get through an encounter. [For example,] you could turn off the vita-chambers and still play it on easy.... But the main criticism that we derived from the first game was the Vita-thrashing exploit, which was — because there were ammo-less weapons in the game and because there were consensual boss fights in the game — the idea of just using an ammo-less weapon and playing Lemmings over and over again until the cliff just disappears. [It was] was degenerate in many many ways... It was fun for no one. So now the Little Sisters will heal the Big Daddys a percentage of their health if you don't take them out. So you do have to invest in their demise." The other design decision Thomas detailed for Kotaku was the recent discovery — in the preview build I reported on yesterday — that players won't be able to backtrack and visit any of the game's large levels once they leave them. While I suspected a narrative reason for this, Thomas said the decision was more of a technical one. "A lot of people don't know this, but the amount of backtracking most players physically did in BioShock was minimal. The amount of effort that went into supporting it was immense. We came down to having to choose between supporting backtracking and much more interesting, readable features ...and decided to invest in things we thought people would actually notice. We also got some knock-on benefits like shorter loading times because of the way the memory was structured once backtracking was no longer an issue." Thomas said that the game will adapt to make the prohibition on backtracking not as punitive to players as they might think. While the player might miss out on some collectibles in the levels they leave behind, they won't miss out on accessing any Little Sisters and the character-enhancing Adam that they provide access to. 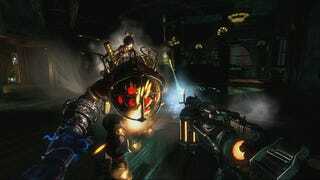 As with the first game, Bioshock 2's levels contain Big Daddy - Little Sister tandems that the player can interact with, killing the Big Daddy and then either rescuing or harvesting the Little Sister for energy. If you don't get to all the Little Sisters in a given level in this sequel, you won't miss out. "When you leave an area, your number of available Little Sisters travels with you," Thomas said. The game will just put more Little Sisters in subsequent levels, and while this could lead to a case of there being lots of them in a late level — should the player not go after many of them early in the game — he doesn't think most people will play the game that way. With less then a month from its February 9 release, BioShock 2 is coming soon. Coming even sooner on Kotaku will be more from Thomas about the ideas and ambitions behind this major sequel.